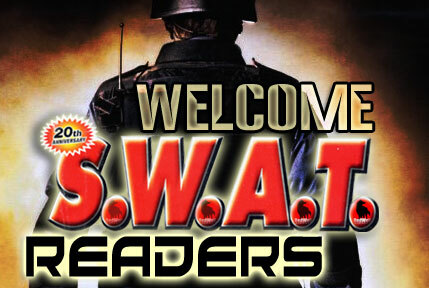 You are here: REDWOLF > Home > News >News Detail - Did you see us in SWAT? Welcome to RedWolf Airsoft, the largest internet retailer of airsoft online. If you do not know what "airsoft" is, then kindly take a quick minute to learn more about this interesting sport that is taking the world by storm. In short, airsoft guns are BB guns that look, feel, and operate just like their real steel counterparts. Airsoft guns are either spring powered, gas powered, or electric powered (through a sophisticated mechanism) to shoot semi, burst or full auto. Their effective range is anywhere from 50 feet to 300feet+ depending on the power of the gun. Many airsoft guns can be upgraded to shoot with more power and accuracy. Airsoft guns can also be very accurate and most pistols will shoot within +/- 1 cm of a target from 20 feet. Sniper rifles can attain the same accuracy from much larger distances. Airsoft guns are so realistic that many law enforcement and military organizations from around the world have chosen to use them for training (including the FBI, US Air Force Security, British Military, French Army, and many more!). Safer and more cost effective than the traditional Simunitions training, airsoft is increasingly the training tool of choice by many real-steel operators. To start learning about how airsoft works, please read our "BEGINNERS SECTION". And if you have questions about how to place an order with us, kindly refer to our "FAQ Section". Some of the more popular models that you may have already seen in SWAT are listed below. But that's not all. We carry thousdands of airsoft guns and accessories that should fulfill your every need.